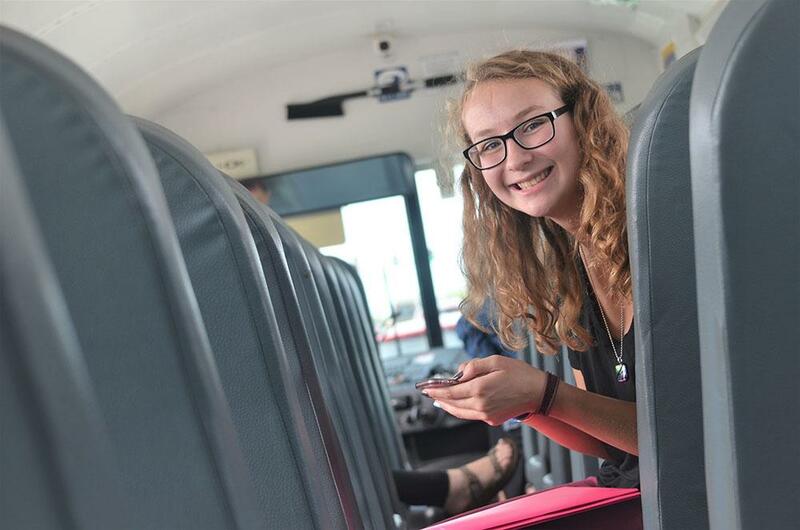 Sophomore Jacque Drown sits on the bus along with her classmates as they near the school. Drown is returning from a field trip to Lenoir Woods Retirement Home with her Teaching Professions class. Photo by Sarah Mosteller. Throughout the year students will continue to learn more about our education system through discussions with people who give insight from a variety of perspectives. Students enrolled in the Teaching Professions course at the Columbia Area Career Center (CACC) went on a field trip to the Lenoir Woods Retirement Home. Tuesday, Oct 8 in conclusion to their education history unit. Teaching Professions teacher Gina Greenplate tasked her students to ask the senior citizens about their education, some of which took place over half a century ago. The Chapel at the retirement home flooded with conversations between the elders and the students. Wrinkled smiles spread across the faces of the residents and laughter resounded among the students. 86-year-old Sharon Pollard, a resident at Lenoir Woods Retirement Home takes time to reflect on her past experiences at school. Sophomores Emily Dearing and Courtney Bach interviewed Pollard about her high school experience. Pollard said “[high school is] The age where rebellion takes place.” Photo by Sarah Mosteller. Teaching Professions teacher Gina Greenplate in her classroom at the Columbia Area Career Center (CACC) talks with her students. Students discuss and wrap up their understandings about what they learned from their field trip to the Lenoir Woods Retirement Home. “The students get the opportunity to just learn about [the resident’s] experiences in education and sometimes their life experiences, too.” Greenplate said. Photo by Sarah Mosteller. 85-year-old Charles Hargrove, a resident at Lenoir Woods Retirement Home tells his story of how he grew up with polio and how that impacted not only his education but every aspect of his life. “I’ve had it since the third grade. Right before the vaccinations came out," Hargrove said. Photo by Sarah Mosteller. Lenoir Woods Retirement Home resident, 84-year-old Nancy Gerhart takes time to recall some of her fond school memories dating back to the early 1950s. Photo by Sarah Mosteller. 81-year-old Al Wight and 80-year-old Cris Wight, residents at Lenoir Woods Retirement Home, have been married for 55 years. They tell the story of how they first met to sophomores, Jacque Drown and Piper Forthaus. Photo by Sarah Mosteller. Teaching Professions students board the Career Center bus and prepare to leave the Lenoir Woods Retirement Home so they may return to school before the lunch bell rings. Junior Chloe James straightens her notes before entering the bus. Photo by Sarah Mosteller. 85-year old Marilyn Hargrove, a resident at Lenoir Woods Retirement Home, is interviewed by some students from the Teaching Professions class. Sophomore Genney Zheng, and junior Chloe James ask her about her education experience as a child. Photo by Sarah Mosteller. Junior Daniel White packs up his belongings as he prepares to leave the Teaching Professions class for lunch. Photo by Sarah Mosteller. 86-year-old Sharon Pollard, a resident at Lenoir Woods Retirement Center, shares the story of how her father owned the Jersey Journal, she elaborates on all the educational opportunities this opened up for her. Sophomores, Emily Dearing and Courtney Bach, sit back and listen to her as she reflects upon some of her personal memories. Photo by Sarah Mosteller. Teaching Professions teacher Gina Greenplate observes interviews between her students and the residents of Lenoir Woods Retirement Home. Her students were assigned to gather interviews as a way to learn more in depth about the history of education. “I observed a lot of engagement. Not only from the students but also from the residents,“ Greenplate said. Photo by Sarah Mosteller. 86-year-old, Sharon Pollard, a resident at Lenoir Woods Retirement Home shares a few laughs with sophomores Emily Dearing and Courtney Bach. The students ask her how discipline used to be handled back when she went to school. “I don’t know because I was never a problem, Pollard said. Photo by Sarah Mosteller. Students currently enrolled in the Teaching Professions course at the Columbia Area Career Center (CACC) exit the Career Center bus to return to their classroom after a short field trip. Photo by Sarah Mosteller. This is so neat!! Such a great idea and article. And the pictures are incredible. Very cool! Good opportunity for students and residents. Excellent photos as well! You did a really cool feature. I liked the incorporation of photos into the piece and you took nice photos. I didn’t know one could do a feature like this until I looked at your piece. It was a cool idea.